Watch out for the invasion of the body snatchers! 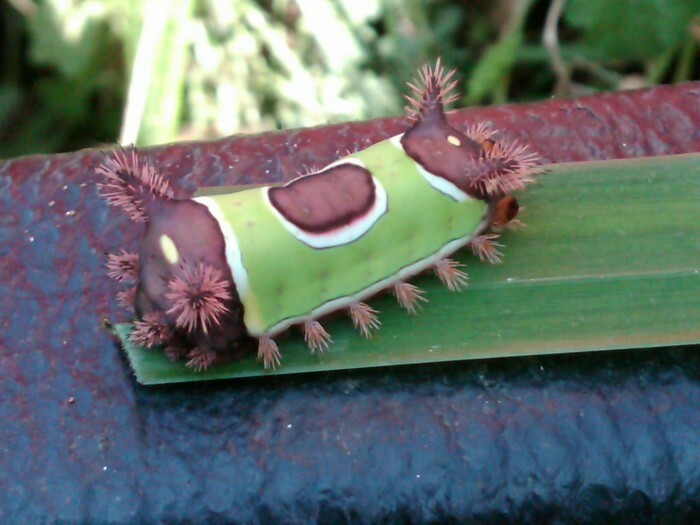 – no really it is just saddleback caterpillars, Sibine stimulea. I have noticed them in my yard this year and I would rather be stung by a bee than stung by this nasty caterpillar. They look like ugly bizarre clowns or a Scotty dog in a green t-shirt! Also known as “pack-saddles”, these two inch long caterpillars are very distinctive looking, and are the larvae stage of a brown moth native to eastern North America. They appear at the end of the summer gobbling up as much greenery as possible prior to pupating into a dull brown moth. Saddlebacks feed on a large variety of plant material and usually are found on the underside of foliage and thus are easy to miss when you are pruning or weeding underneath greenery. My particular caterpillars were feeding on the underside of a weeping beech and I was crawling underneath the tree to prune it. I felt an intense burning sensation and flinched back, but they had already stung me. The caterpillars have fleshy horns on either end bearing urticating hairs(irritating bristles) that secrete venom. These are hollow quill-like hairs that have poisonous sacs at the base of them which can excrete a poisonous punch.The venom causes a very painful swelling and can cause nausea and a rash that can last for days. The best remedy for the stinging and swelling is the application of ice. Also, if you use some sticky tape to remove the barbs immediately, you can reduce the amount of poison that is excreted. If you are very allergic to stings, it is best to use an epi pen for a bad reaction. I always see these caterpillars in groups of 2 or 3, so you are likely to be stung by several at once. It just gives me shivers to think about it! Yuck. I’m not a big insect lover to begin with. This little guy looks ugly! Sorry you were stung. Thanks for the tip! They’re very pretty, if mischievous little creatures!